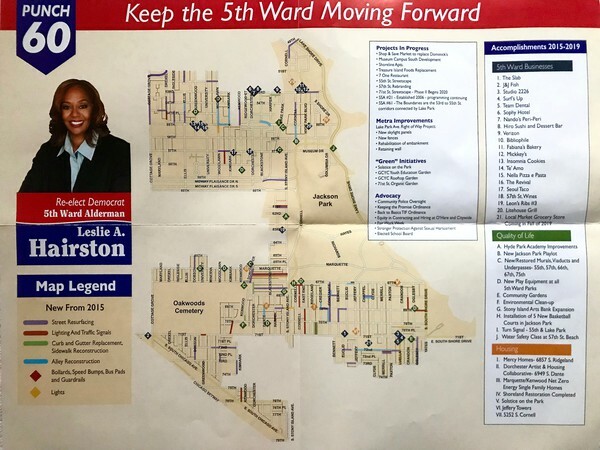 Incumbent Fifth Ward Alderman Leslie Hairston is heading into her first runoff election since she was elected in 1999. Her challenger is Will Calloway, an activist running for elected office for the first time. Both said they are confident about their chances. Hairston said that “one candidate has experience and the other does not,” referring to Calloway’s lack of experience serving in an elected office, which she thinks will hurt his chances. She said she will be ready for what she sees as a time of change in Chicago politics, as the city will elect its first black female mayor, either Lori Lightfoot or Toni Preckwinkle, in April. 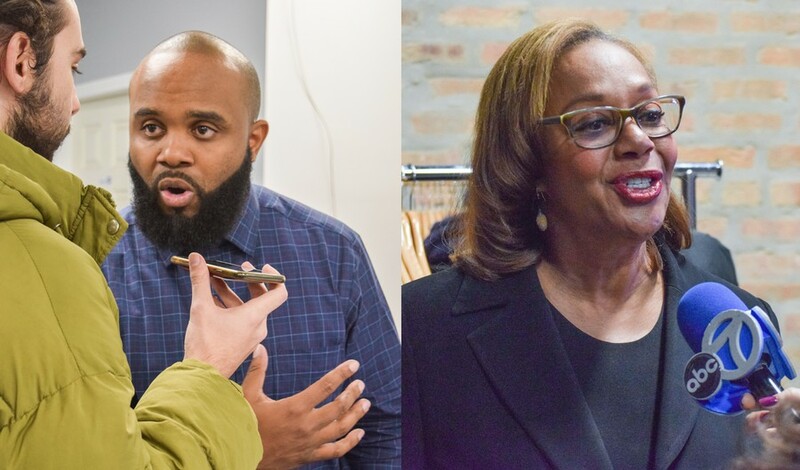 Calloway thinks that voters are becoming aware of Hairston’s “failing leadership,” referencing poor attendance at City Council committee meetings and a voting record closely aligned with Mayor Rahm Emanuel’s policies. Third-place candidate Gabriel Piemonte gave Calloway his support in an endorsement on Monday, which Calloway thinks will help him out in April. “Me and him together made up 51 percent of the vote so if his base turns out with my base, that would be enough,” Calloway said. “The voters spoke and the majority of the voters said that we should go in a different direction for the next four years." Calloway has also received endorsements from Willie Wilson, the mayoral candidate who came in fourth in city elections, as well as the Chicago Tribune editorial board. With the runoff elections around the corner on April 2, here’s where each candidate stands on the issues facing the Fifth Ward. Calloway emphasized reducing inequality within the ward, which spans most of campus, Jackson Park, and parts of Woodlawn, Greater Grand Crossing and South Shore southwest of Jackson Park. The neighborhoods in the southern part of the ward, like South Shore and Greater Grand Crossing, are where Calloway saw a lot of support on election night. Calloway said that as alderman, he would be responsive to the needs of the entire ward, especially in areas he thinks Hairston neglected. He added that his background as a community organizer allows him to make monthly meetings with constituents more engaging and inclusive and would get Hyde Park residents more involved with the ward’s activities. Hairston said there was no unequal treatment within the ward and that she thinks voters would agree if they saw what she has accomplished in the ward over the last few years. A map published by Hairston’s office detailing projects in the Fifth Ward over the past four years shows that initiatives related to improving quality of life—such as new equipment for playgrounds—and the vast majority of new affordable housing developments, are in areas south and southwest of Jackson Park. However, the map also shows that two-thirds of new businesses in the ward opened in Hyde Park over the same time period. Both believe that the University has not done enough to support the ward it resides in. Hairston said her relationship with the University has been productive in some ways, citing the new UChicago Medicine adult trauma center that she publicly supported, but she also said that UChicago can do more to support local businesses with its resources instead of trying to buy more land in the surrounding neighborhoods. Calloway noted that the University only acted on things like the trauma center after a large amount of pressure from community activists. He said he believes the University can dedicate more resources to combating mental health issues in the ward. Asked for concrete plans with the University, he said he still has to think more about other issues involving the University before he can speak about his plans to deal with them. The Fifth Ward is often described as a “food desert,” but Hairston has been taking steps to resolve this issue. She recently announced she had secured a grocery store development that will replace a vacant Dominick’s in the Jeffery Plaza shopping center on 71st Street in South Shore. Shop and Save purchased the center and plans to open a store by fall this year. According to Hairston the store will include a wine bar, halal meats, and outside dining among other features. Calloway said that he and voters in the Fifth Ward are still not satisfied with the development, claiming that the store is not a good fit for the community. The chain focuses on Polish products and dishes which he does not think will mesh well with the largely African-American population of the Fifth Ward. He also claims that Hairston decided to announce the development a few days before the election to improve her standing with voters. “I think it’s six years too late. Six years is too long for a community to go without a grocery store,” he said. Hairston said that the long wait was because of buyers that eventually fell through because they didn’t have funds and delayed the process, one of which was a local African-American grocer. Calloway said he plans to work with Shop and Save should he become alderman to ensure that the community’s needs are met. He added that he is also a firm believer in farmers markets and wants to further bring them to the community as a more local grocery option. He said he also plans to enact a system for delivering groceries to the ward’s elderly and disabled residents. The incoming Obama Presidential Center (OPC), which will be located in Jackson Park, will directly border the Fifth Ward and has raised concerns among residents of the surrounding neighborhoods. Some people are worried that displacement of residents, rising property taxes, and gentrification may result from the building of the OPC. Community activists have been advocating for a community benefits agreement (CBA) to protect residents from displacement. On election day, 88 percent of voters in the fifth precinct of the Fifth Ward voted in favor of a CBA ordinance for the OPC in a non-binding referendum vote. Calloway supports a CBA and its anti-displacement measures, including a freeze on property taxes, affordable housing development, and job funding for residents in the surrounding area. He also wants to ensure that minority-owned contractors are given a fair share in bidding on the construction and maintenance jobs for the center. Hairston on the other hand has supported her own neighborhood stabilization plan for the South Shore neighborhood over the proposed CBA. She maintains that her plan is a way to keep the conversation between the community and the Obama Foundation open. The Obama Foundation does not support a CBA. Because of this, Hairston thinks her plan is a “creative” way of keeping the community involved in the conversation about the OPC. She said she would still be in favor of bringing community groups together to figure out what they want out of the OPC and ensuring that if these goals are not met by a CBA, that they are met by the neighborhood stabilization plan instead. In light of recent scandals involving aldermen abusing their power for personal gain, including Edward Burke of the 14th Ward and Willie Cochran of the 20th Ward, questions of how to check the power of aldermen have gained prominence in this election cycle, with some supporting the implementation of term limits. Hairston, who is serving her fifth term as alderman, did not agree that this would be a reasonable check of power, saying that some projects take more than one or two terms to accomplish as an alderman. Calloway, however, supports the term limit and believes that an alderman should not be in office for more than three terms. He has pledged as part of his campaign to limit himself to two terms. Calloway proposes other ways to improve the turnover of aldermen, including the “grooming” of viable replacements in each ward. This would entail emphasizing civic education in schools and also through shadowing programs where young people can learn how City Council and being an alderman works. He said that Hairston, as well as other aldermen, currently in City Council have failed to do this. He also supports recall legislation that has been introduced in the Illinois House of Representatives that would allow Chicagoans to prompt a recall election for mayors, aldermen, and Cook County state attorneys by getting a certain amount of signatures on a petition. “I believe that in cases of corruption, where there’s a high level of suspicion of corruption, like with Ed Burke and so many other aldermen, that the community should have the power to recall these elected officials,” he said. Both, however, agree that aldermen should keep aldermanic privilege, which allows them to have the final say on developments in their ward. Calloway said that while some aldermen, such as Burke, have abused this privilege, the issue is more about the people that have this privilege and not the privilege itself. Hairston said the privilege is necessary in order to protect communities from unwanted developments but agreed reforms should be put in place to prevent abuses. Challenger Gabriel Piemonte said his goal was a race in which less than 50 percent of the vote went to Hairston, to trigger a runoff.